Pete Rose. Charlie Hustle. Baseball's hit king. Pete was by far one of the best players to ever play. He was an All-Star 17 times. He won two Gold Gloves and two World Series rings. He was named Rookie of the Year in 1963, NL MVP in 1973, and World Series MVP in 1975. You name it, Pete Rose did it. Sure, maybe he bet on a few baseball games but is that really any worse than everyone from the "Steroid Era" using performance enhancing drugs? 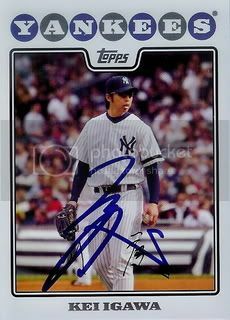 Pete signed the card below for me TTM last week. 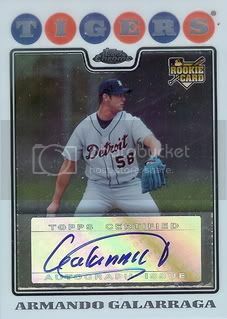 It is one of my best returns ever and am glad to have this card in my collection. 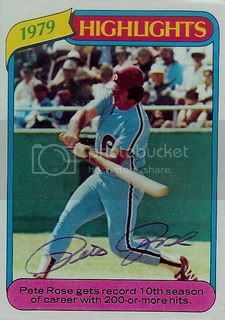 While you admire this awesome signed card of Pete Rose, consider how many more cards you could get with a little extra cash. Online sports betting is a fun way to get that extra cash. Another Diamondback today. Billy Butler the card below. We sent this one to Billy c/o AAA. He was recently called up so it's great to get this one back. 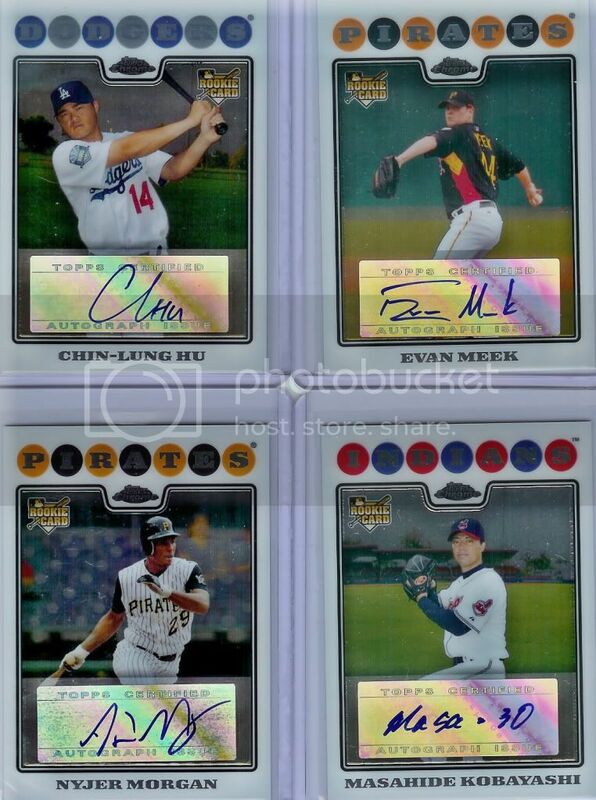 Picked these six cards up off eBay for about $2 each. They were all inserts from 08 Topps Series 1. 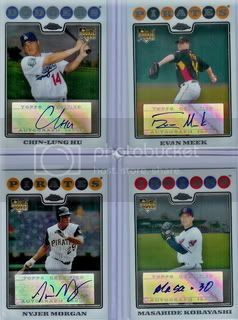 Kind of like the Chrome autos I got recently, I'm not really planning on getting all of these but I thought they'd be a nice addition to our set. Got another good one back. 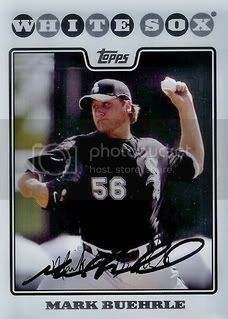 Chicago White Sox pitcher, Mark Buehrle signed a card for the set. Mark is a three time All-Star and a World Series Champion. Needless to say, I am very glad to get this one back. 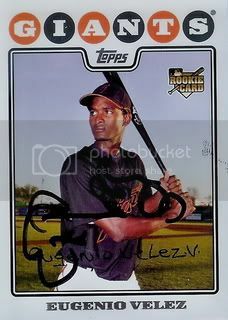 San Francisco Giants infielder, Eugenio Velez signed the card below for our set. Looks good. Thanks, Eugenio. 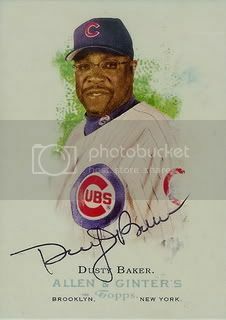 As a player, Dusty Baker was certainly above average. He was a two-time All-Star, a World Series champion, and a Gold Glove winner. Over the past two decades, Dusty has become one of the premiere managers in the game. He has led the San Francisco Giants, Chicago Cubs, and now is the manager of the Cincinnatti Reds. During his ten years with the Giants, Dusty led the team to the playoffs three times including a World Series appearance in 2002. He helped the Cubs win the NL Central in 2003. He is currently leading a young Reds team that is on the verge of becoming an NL powerhouse. While with the Giants, Dusty won three Manager of the Year awards. He is one of only a few managers to win this award multiple times. I've gotten Dusty's autograph a few times. 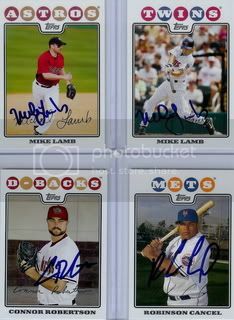 The card below was signed TTM during Dusty's short break from coaching. 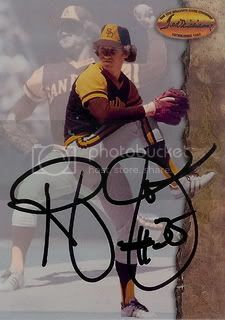 Two time All-Star Randy Jones was the first San Diego Padres pitcher to win the Cy Young Award. After being named Comeback Player of the Year in 1975, Jones would win 22 games with an ERA of 2.74 in 1976. Randy was nice enough to sign the card below for me through the mail awhile back. He cooks up some pretty good BBQ too. If you're ever at Petco Park, be sure to check it out. The other day I received a package from a friend on SweetSpotGraphs.com. Very pleased to see four signed 08 Topps cards. These are a great addition to our set! 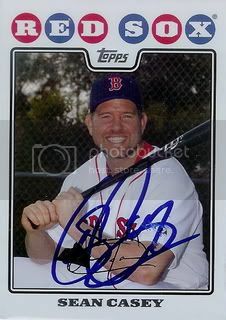 Three time All-Star and current MLB Network analyst, Sean Casey signed his card from the U&H set. I love the MLB Network and am very glad to get this one back. Picked this one up on eBay for less than $5 shipped. This is our fifth different certified auto from the 08 Chrome set. Honestly, I haven't even looked to see how many there are. I guess I'll keep my eyes out for any more great deals. 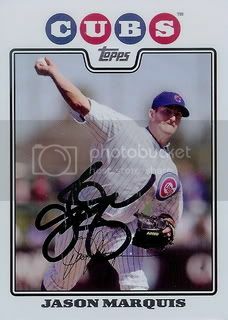 Got back a signed 08 Topps card from former Cubs and current Rockies pitcher, Jason Marquis today. Another nice addition. Thanks, Jason! 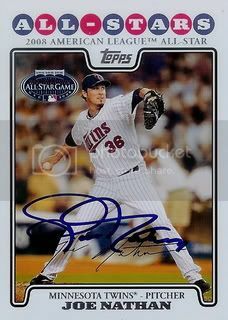 Minnesota Twins closer, Joe Nathan signed his All-Star card from the 2008 Topps Updates & Highlights set. 2008 was Joe's third All-Star appearance. Really glad to get this one back. I realized I hadn't done one of these all month so I figured it's time to highlight another Award Winner. For whatever reason, Roy Halladay always seems to get overlooked when the best pitchers in baseball are brought up. However, Roy is a five time All-Star. He has won 15 or more games five times which includes two 20+ win seasons. 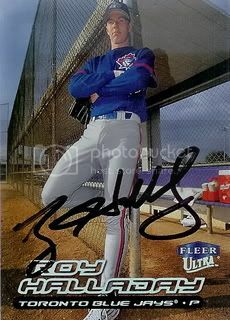 In 2003, Roy's 22 wins, 3.25 ERA, and 204 strikeouts were good enough to win him the American League Cy Young award. There has been a lot of talk early this season about Roy picking up his second Cy Young. So far he is 8-1 with a 2.78 ERA. Best of luck to Roy and the Blue Jays as they try to hold onto first place and stay ahead of the Yankees and Red Sox. Another good one today. 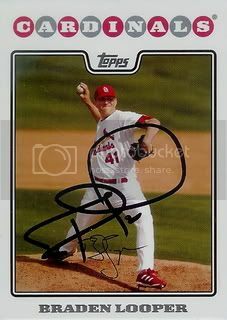 Former All-Star and current Mets reliever, J.J. Putz signed a card for the set. 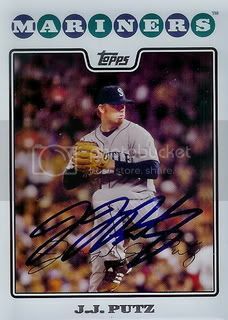 J.J. was named to the American League All-Star team in 2007 while pitching for the Seattle Mariners. I'm pretty sure that Yankees pitcher, Kei Igawa isn't really considered a prospect any longer. Kinda glad to get this one back because I have a feeling he may find himself pitching in Japan soon. 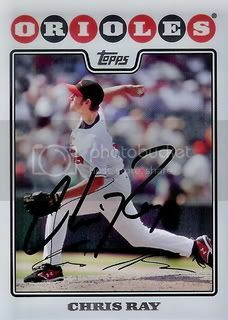 Orioles relief pitcher, George Sherrill signed another card for the set. George had previsously signed his All-Star card. It's great to get his regular card back too! More mail again today. 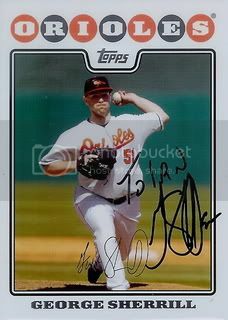 Orioles relief pitcher, Chris Ray signed the card below. It was announced yesterday that George Sherrill is out as closer in Baltimore so maybe Chris will get a few more save opportunities. 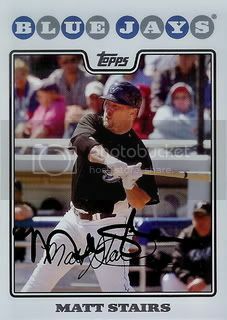 Former Cubs outfielder and member of the 2008 World Champion Philadelphia Phillies, Matt Stairs quickly signed a card for the set. Another good return. This one is from Tampa Bay Rays pitcher, Andy Sonnanstine. Andy was a big part of the Rays success last year. He's off to a slower start in 2009 but I'm sure he will pull it together and put up big numbers by the end of the season. 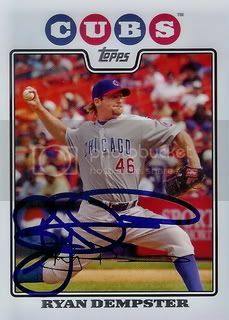 Nice TTM return from Chicago Cubs All-Star pitcher, Ryan Dempster. 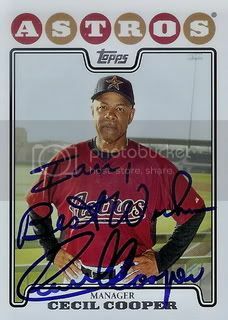 Former Brewers all-star and current Houston Astros manager signed the card below. Another great addition to our set. Thanks, Cecil! 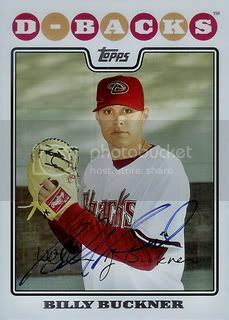 Today brought former St. Louis Cardinals pitcher, Braden Looper. Braden signed with the Brewers this off season and is off to a good start in 2009. Another good day today. 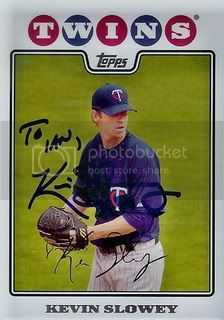 Minnesota Twins pitcher, Kevin Slowley sent back the card below signed in blue. 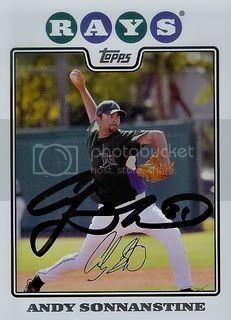 # UH 89 - Joakim Soria! 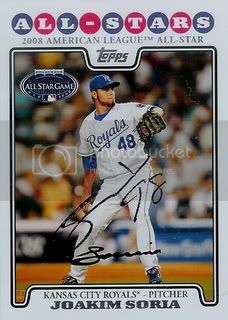 Received a surprise in the mail today from zman40... Joakim Soria! I'm totally stoked to have this card. Joakim is quickly establishing himself as one of the better closers in the game. Please take a moment to check out zman40's Autograph Blog. He is going year by year posting cards from his collection. Really cool. Finishing up the mail week in good fashion with another card for the set. 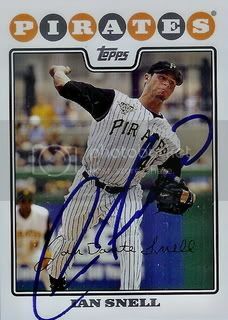 Today brought Pittsburgh Pirates pitcher, Ian Snell. 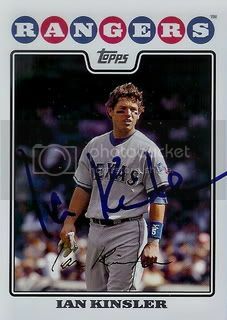 Back in Spring Training, I was able to get Ian Kinsler to sign a card. That makes two out of three Ian's from this set. I found these on eBay for a good price so I decided to pick them up. I'm not really planning on doing anything with the Chrome set but I thought they would be a nice complement to our regular 08 Topps set. There are a few other players available, I wouldn't be surprised if I try to get those too. 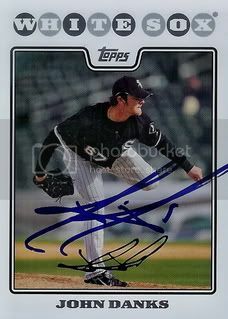 White Sox starting pitcher, John Danks signed the card below in a little over two weeks. John had a good season last year, winning eleven games for the American League Central Division Champions. I have a feeling John will do even better this year.